Two weeks from today! Pay attention! After you're all done tasting a hundred beers or so at Grovetoberfest, the fun DOES NOT need to end! 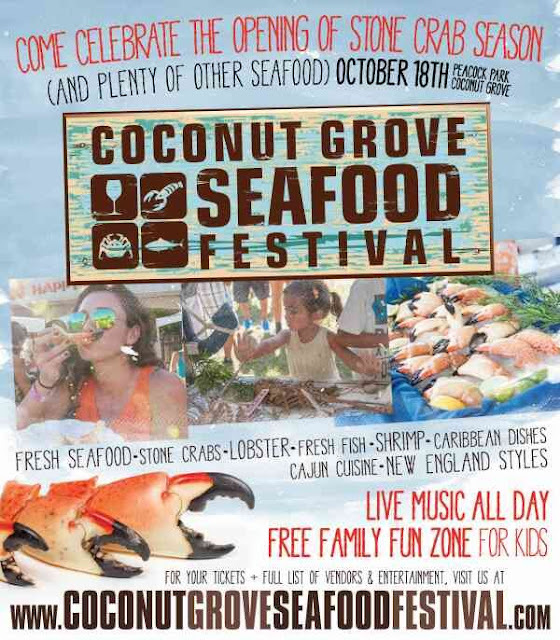 Go home, get some rest and prepare yourself for the Coconut Grove Seafood Festival the very next day, October 18, 2015, same location at Peacock Park in Coconut Grove! I must say that booking a nearby hotel deserves some serious consideration (or try making some new friends)! Shrimp, Stone Crabs, Lobster, and Fresh Fish? Hell yeah! I'm totally psyched to check out this event, and I think it's super cool that it's a family friendly one as well. Get some tickets here and you'll see why they say "Seafood + Coconut Grove = a match made in heaven!"